Imagine an 1870s southern gentleman from Atlanta, schooled in Latin, Greek, French, and the latest techniques in dentistry, such as the use of ether and restorative surgery. He treats everyone he meets with respect, though you’d do well not to question his truthfulness or mention the name William Tecumseh Sherman. He knows how to calm a frightened horse or a child, having innate empathy for both, and the hands that draw rotten teeth can play Beethoven on the piano like a virtuoso or deal faro or poker all night. But the great tragedy of this accomplished, engaging young man’s life–for he’s twenty-two–is that he’s dying of tuberculosis, the disease that took his beloved mother from him years before. He’s playing a losing hand against time, yet pretends he doesn’t know it. John Henry Holliday’s graduation photo from the Philadelphia School of Dental Surgery, 1872. He was not yet twenty-one (Courtesy Wikimedia Commons; public domain). His name is John Henry Holliday, known as Doc. And if you read this marvelous biographical novel, which I highly recommend, you can forget anything you think you know or have heard about his reputation as a gunslinger or cold-blooded killer. 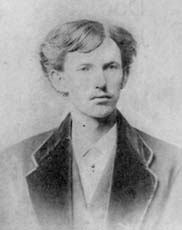 According to Russell, who argues openly for her subject, there was plenty of mayhem in Dodge City, Kansas, where Holliday settles, hoping the climate will help his lungs, but few duels with six-shooters. And what Hollywood and popular legend have made of Wyatt Earp, the Earp brothers, the O.K. Corral, or Bat Masterson bears little resemblance to fact or, more importantly, a deeper, more compelling story. Rather, Russell portrays a Holliday who wishes to live to the fullest. He loves poker, waxing philosophical about “the enchanted moment” when a bet is placed, when “anything is possible” and a “man’s debts and regrets and limitations disappear.” But true satisfaction comes in his dental office. For instance, having intuited that Wyatt Earp never smiles because of damaged teeth, Holliday deploys all the art and science he commands to ease his friend’s pain and make him happier. Lonely for people who understand Dostoyevsky, Austen, and Brahms, he’s ecstatic when he meets a former Prussian aristocrat turned Jesuit priest, with whom he discusses Scripture and music. When Father Arnsperger says that he heard Chopin himself play, Holliday dramatically flings himself back and responds, “I am prostrate with envy, sir!” It figures that the woman Doc takes up with, Mária Katerina Harony, known as Kate, comes from a Hungarian noble family and can quote Latin and Greek right back at him. In less skilled authorial hands, a narrative like this could sound cute, superficial, or elbow-in-the-ribs obvious, quirky for its own sake, gimmicks to lure the reader with anecdote after anecdote about the rollicking Old West. Not here. Russell provides plenty of funny, poignant stories, and she’s combed the historical record for one-liners, a few of which are memorable. But the characters seem so completely themselves, and the time and place so fully lived in, that she achieves a portrait of Dodge in a wide, deep swath. Front Street was alive with young men. Sauntering, staggering. Laughing, puking. Shouting in fierce strife or striking lewd whispered bargains with girls in bright dresses. They were giddy with liberty, these boys, free to do anything they could think of and pay for, unwatched by stern elders, unseen by sweethearts back home, unjudged by God, who had surely forsaken this small, bright hellhole in the immense, inhuman darkness that was west Kansas. But it’s not just the vigorous prose; the characters’ stories illumine so many facets of life. For instance, Wyatt’s unsmiling, unflinching code of right and wrong forms a counterpoint to the rest of Dodge. The story behind Bob Wright, who owns the general store (and much else), captures local politics and business ethics. How people treat Mr. Jau, the Chinese laundryman who gives Doc herbal medicines for his TB, shows how racial prejudice plays out. And Kate, a whore like almost every other woman in town, exemplifies the unequal struggle against men, their desires, and self-aggrandizing misperceptions–she’s just more astute, if crazier, than her sisters. Russell has researched so much about everything that it would be easy to ascribe her achievement to what she’s learned and how she’s deployed it. That’s certainly the public perception about historical fiction; tell someone you’ve just met that you write in that genre, and nine times in ten, you’ll be told how hard the research must be. But any good novelist, historical or otherwise, must have psychological insight, and you won’t find that in the library. What puts Russell in a different class, I think, is how she tackles issues like Doc’s feelings about death or Wyatt’s about bullies, which makes these characters–and the narrative–richer and fuller, not just another rollicking tale about the Old West.